The use of the "arbitrary" in the creation of works of art has often been central to avant-garde strategies, employed to subvert or rework traditional forms of artistic expression. 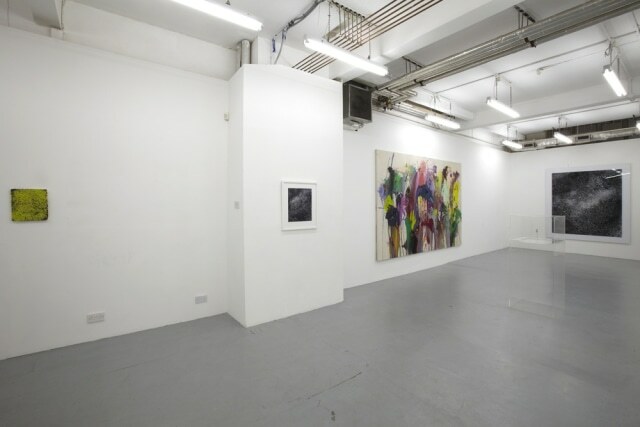 Through varied applications, the works in this group exhibition incorporate this ethos, whether through automatism, action-based techniques, or through capturing existing scenes. Mauro Bonacina executes his ongoing series of "balloon" paintings by filling balloons with acrylic paint, and creating a composition by nailing them to the canvas. The surface is then tilted to allow the paint to run, drying in individual layers, in a technical approach that incorporates a relinquishment of control reminiscent of the Abstract Expressionists. Jodie Carey's works are made by pouring plaster over ash and delicately patterned lace sheets. Once dry, the ash settles on the lace in ethereal patterns that dance in and out of focus across the plane of the plaster slabs. These sculptural pieces pay tribute to the transience of human existence, memorializing the everyday traces that mark our passage through the world. Alex Hoda's Carrara marble sculpture of a piece of chewed Nicorette gum is scaled up from the original object using 3-D modeling. Sculpting the gum blindly, using his teeth rather than hands, the work recalls Hoda's underlying engagement with the Surrealist's procedures of automatism. Nicolai Howalt's photographs, drawn from his series Endings, present a study of death in the form of the ashes that remain following the cremation of a human being. Recalling images of distant star systems and galaxies, these dust landscapes beg the question of our material positioning within the universe. At the heart of these works lies the paradoxical tension between chance and choice, begging the question of what impact the relinquishment of subjectivism has on the meaning of an artwork, and the role of the artist as an autonomous creator.